Shahrukh Khan (SRK) born 2nd November 1965 in New Delhi. Parents Mir Taj Muhammad and Lateef Fatima. Lived in Rajinder Nagar. 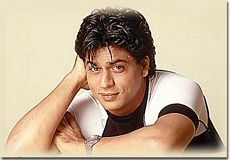 SRk studied at Delhi University's Hans Raj College and earned Honours in Economics. He is married to Gauri. Has 2 children Aryan (13th November 1997) and Suhana (23rd May 2000). 08/30/2006: Board member of Jet Airways airlines. Endores ICICI NRI banking, Hyundai's Santro and Getz, Himani talcum powder and Hewlett Packard’s Compaq Presario notebooks and desktops. Shahrukh Khan (SRK) and Aamir Khan will both been seen in the upcoming movie Luck by Chance (2009) directed by first time director Zoya Akhtar , sister of Farhan Akhtar and daugther of well known poet and lyricist Javed Akhtar . The two stars are in the same movie, but do not share any onscreen scene time together. They both play themselfs in the movie, Shahrukh interacts with Farhan and Aamir with Konkona Sen Sharma . The movie is due to release on January 30, 2009.